Files with pmt suffix can be found as tutorials for the PhotoModeler Lite 3D modeling software. What is pmt file? How to open pmt files? 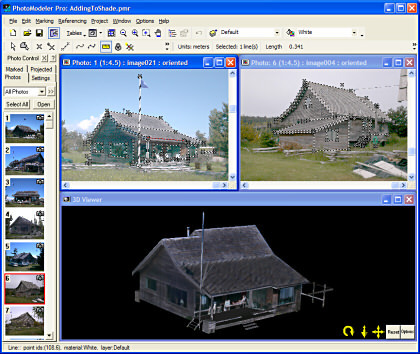 File extension pmt is probably best know for its use in PhotoModeler Lite 3D modeling software for Windows that allows users to create measurements and models from photos taken with an ordinary camera. A .pmt file stores tutorials for Lite version of PhotoModeler. PhotoModeler is image-based modeling tool used to create 3D models for engineering, architecture, film, forensics etc. You can use these tutorials within PhotoModeler. It does not seem likely that this file type is meant to be converted to anything else. It is only useable within the original program. and possible program actions that can be done with the file: like open pmt file, edit pmt file, convert pmt file, view pmt file, play pmt file etc. (if exist software for corresponding action in File-Extensions.org's database). Click on the software link for more information about PhotoModeler. PhotoModeler uses pmt file type for its internal purposes and/or also by different way than common edit or open file actions (eg. to install/execute/support an application itself, to store application or user data, configure program etc. ).